Cliff of Sasso del Drago. 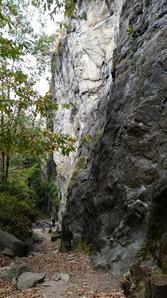 The Falesia offers many beautiful athletic routes and well bolted for all levels. Access: Reach the village of Chiavenna. Then continue to Santa Croce. About one kilometer from the village of Santa Croce di Piuro, a parking lot can be found along the highway 37 of the Maloja. Leave the car and from there in a few minutes follow the path to the two sectors. Rock: Gneiss. Technical climbing on vertical and overhanging walls.